Good looks are not everything - what is on the inside counts too. 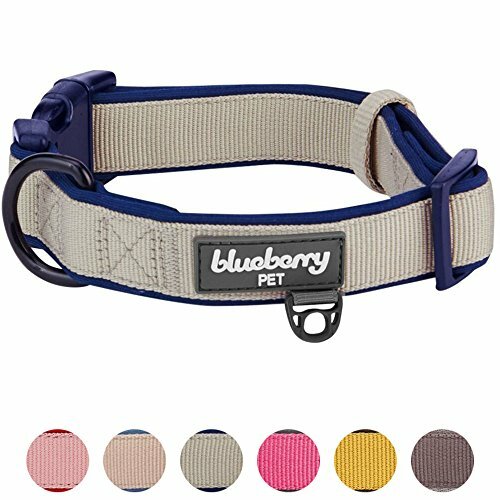 With this practical methodology, Blueberry Pet strives to provide the best quality designer dog collar to our customers. This MADE WELL dog collar collection features luxurious neoprene webbing with polyester ribbon sewn on top and offers a modern spin on classic dog collar style. You will find the best-selling dog collar structure that Blueberry Pet launched in the past for all loved pups - classic black D-ring, durable plastic buckles, and the accessory loop. The modern spin belongs to its unique color selection, which was handpicked by our in-house designers. This neoprene dog collar is available in 6 color combinations: beaver brown with taupe gray webbing, light khaki with oxford blue webbing, beige with glaucous blue webbing, muted red-violet with gray webbing, peony with red webbing, and ginger with brown webbing. You will not be disappointed as this dog collar brings ultimate comfort to your four-legged friends and they would wear all year round. Versatile and easy to match with any dog accessories, this dog collar is the editor's favorite pick for this special season! Neck 18"-26", Entire webbing width 1 1/5", Ribbon on neoprene layer width 1", Size Large; The collar does not stretch itself, please make sure leave ONLY 2 fingers between collar and dog neck. A properly fitting collar and harness won't leave any room for your dog to chew. Made of quality neoprene webbing and polyester ribbon sewn on top. All buckles are made from eco-friendly plastic. The metal D ring is black coated to add durability.